In September 2012, the Free Syrian Army encountered mild controversy when they bombed two hospitals in Syria and didn't even bother blaming the government, taking credit themselves. These were apparently functioning hospitals, staffed, and treating the wounded. Syrian rebels claim to have blown up a hospital in Al-Qusayr near Homs and uploaded videos of the deed. 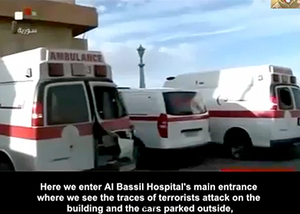 This video names this as the al-Watani hospital. 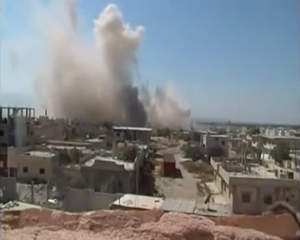 Amateur footage appears to show two huge explosions in the Syrian city of Homs, which purportedly took place on Monday. The rebel in the video can be heard saying: "Al Frouq brigade blew up the National hospital, which used to be for people, but now is being used by Assad's forces." ... The footage emerges as the governor of the Homs area says that the city has suffered an estimated $9 billion in destruction." The video is shot from this rooftop. A Russian documentary included footage ostensibly uploaded by rebels to show their preparations. They study maps, secure a massive bomb, dig a 500-meter tunnel underneath the hospital, and then detonate. From the look of this geyser of dirt filmed a half-mile away, no one in the hospital could have possibly survived. Another video, apparently second-hand, shows the same explosion view and prior to it some apparent views of the planning. At least 17 people have been killed by a car bomb in Syria's largest city, Aleppo, state news agency Sana says. Syrian state TV said two hospitals and a school were largely destroyed by the blast near the city sports stadium. The Free Syrian Army said it carried out the attack because the facilities were being used by government troops. Earlier, a strike killed at least five people, witnesses said. Sept. 9, Deborah Lutterbeck reports. "Residents said the facilities were used to house soldiers fighting an 18-month uprising against Assad. A woman cries for her son who was killed in the blasts. The Free Syrian Army said in a statement that it carried out the Muncipal Stadium district attack, killing or wounding 200 troops. It said the bombs were planted inside the buildings in cooperation with a loyalist sympathiser." Two bombs exploded simultaneously on Sunday night next to Syrian army compounds in the northern city of Aleppo, killing and wounding scores of President Bashar al-Assad's forces, residents and opposition activists said. The bombs targeted makeshift barracks and the military police headquarters, situated in two adjacent sealed off districts in the centre of the city, said several residents and opposition campaigners from Aleppo. The state news agency said an explosion near a hospital and a school in the Municipal Stadium district killed 17 people and wounded at least 40. Residents said the facilities were used to house soldiers fighting an 18-month uprising against Assad. "The army had taken over the neighborhood and emptied it from residents. The hospital was turned into army barracks," said activist Ahmad Saeed. Syria attacks hospitals, denies healthcare as 'weapon of war': U.N A September, 2013 Reuters reporttells of a U.N. investigation into targeting of the healthcare system that put massive blame on government forces for "occupying" national hospitals, torturing patients inside them, attacking patients with sniper fire from them, and bombing free rebel field clinics, etc. In the flavor of the times, the report also blandly mentions some token rebel violations they didn't bother to screen and conceal like the others. The U.N. team had details of a smaller number of incidents when rebel forces attacked hospitals (and never said otherwise - ed). November, 2013: Reported al-Qaeda (Al-Nusra, ISIS) rebel attack on al-Baasel/Bassel hospital in the Christian town of Deir Attaya, north of Damascus. Two car bombs on the 20th were followed by an incursion into the hospital. The hospital itself seems only lightly damaged, but it took days before the hospital was secured (and about a week from the initial attack before Deir Attiya itself was declared rebel-free). During their stay, rebels reportedly attacked patients with grenades and shot down staff. At least nine civilians were verified killed by the SOHR. Details have been slow to come together and could wind up far worse. For more details see talk page section. On December 21, an al-Qaeda-led attack on Syrian military forces at Aleppo's Kindi hospital, near the besieged central prison, was ended decisively with a reported twin suicide bombing. 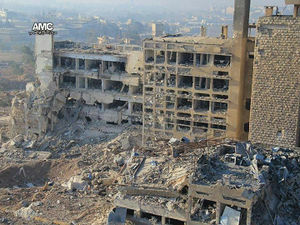 Photos of the facility after show it utterly ruined (see inset) by blasts said to be of "dozens of tons" of explosives. It's clearly ruined by now as a hospital capable of saving lives or doing anything useful. "Prior to November 2012 Government forces converted al Kindi Hospital into barracks, and the hospital stopped functioning in November 2012. After the government takeover, the inoperative hospital switched hands multiple times between government and opposition forces before it was completely destroyed in December 2013." The entry includes video "FSA celebration at al Kindi Hospital after takeover." They seem to mean the government destroyed it by militarizing it, making this inevitable; it was "destroyed" in November, 2012, but with a change of purpose that was clearly in a planned manner that harmed no one. At the least, this doesn't fit the violent profile suggested. It's worth wondering or perhaps checking how many other of their 135-or-so government attacks were even allegedly actual physical attacks. This page was last edited on 5 October 2016, at 16:17.